When you have a few choices of a guidebook you can research which one is rated the “best of the bunch”, but when it comes to the GR11, there are very few choices, especially when you need an English Guide Book. If you go online and read user reviews about the latest Cicerone Guide Book GR11 Trail you will be none the wiser, most people rated the guide as fairly decent, but then there are those that claim the book and in some cases the author were pretty useless and misleading. I had very little choice, so went ahead and ordered the guide book. 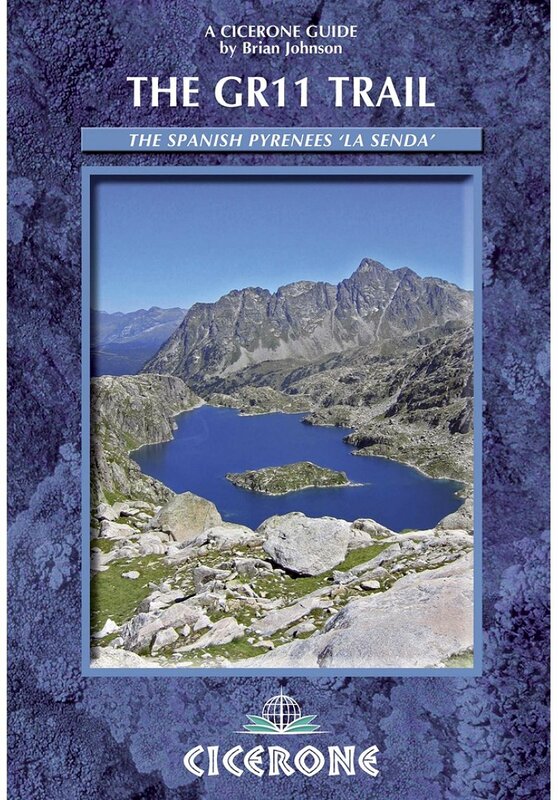 I also ordered the Spanish Prames GR11 Senda Pirenaica not for guide book, but for the maps. I received the guide book in July 2015, and by the time we left for Spain on May 26th, I had read it about a 100 times. The guide is a nice size, lots of people complained about the weight, but I really think the weight and quality balance is perfect. What did we think of this guidebook ?? I can honestly say that this is by far the best guidebook I have ever used. 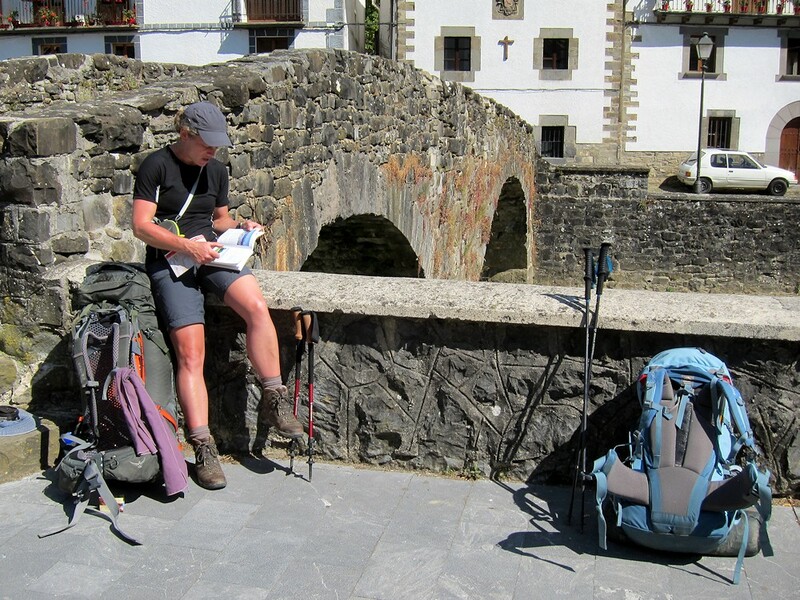 We walked for 51 days using this guidebook, and lost our way only 2 times [ very minor, missed a turn-off both times, but soon realized and got back on track within the hour ] NONE of these where the fault of the book, actually if we had spent more attention to the book, we would not have missed the turn-offs. Brian Johnson’s detail to the trail is second to none, whenever we were in doubt, we would check the book, and it all became clear. Although we carried the Prames Maps with us, we never actually used the maps. We did the GR11 only using the guidebook. While on the GR11 we met a handful of hikers [ we were there early in the season ] and every single one of them praised Brian Johnson and how well the book was written. What we REALLY liked about this guide, was the “reliable” water-points, highlighted on the map, and color coded in the route description – this really made the walk a lot easier and lighter. How do I rate this book out of 10? An easy 9.5 out of 10, I honestly think it would have been a 10/10, however the book did let us down big time once**. What did I really like about this book? The quality of the book / binding was superb! – It took a real beating on the trail and was used extensively for a lot longer than the 51 days. Not a single page is loose, let alone fallen out!. Water-points were a huge bonus, and 95% still accurate. Un-like other guidebooks I have incl. Cicerone Guides, this guidebook is laminated, excellent for wet weather. What I personally would have liked, is if there was a blank notes page at the end of each stage to write comments / ideas / changes etc. I understand this would make the book slightly heavier, but I would have definitely benefitted from this. Absolutely no hesitation, anyone planning on doing the GR11 should have this book. ** we doubled up on stage 41 – 42 and after a very long tiring and hot walk we arrived in La Jonquera to finally find out that there were no Campgrounds [ 2 mentioned in book ] and as confirmed by the Tourist office, there never has been.. We continued for just an hour and found a wonderful spot with water at the church. We are in no way, shape or form affiliated with Cicerone or the author of this guidebook. This review is 100% based on our honest thoughts and opinion.